New Barys forward Curtis Valk talks to KHL.ru about his Dutch ancestry, his famous goaltending great uncle, his one NHL appearance and much more. The 25-year-old Canadian has crossed the Atlantic for the first time in his career and so far, he seems to be settling in fast. 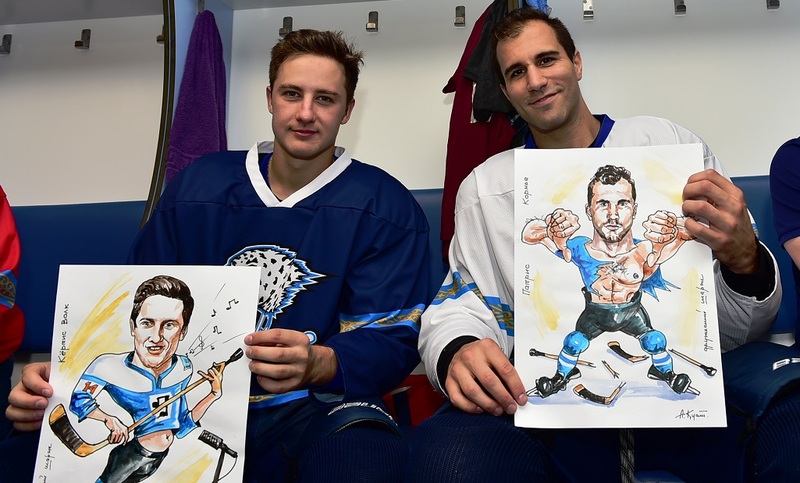 During the first pre-season tournament in Astana he claimed the game-winner for Barys against Amur. Valk was born in the small town of Medicine Hat, in Western Canada, where he began his hockey career. At 177 cm and 75 kg, he was considered too small for the NHL draft despite some eye-catching performances in the minor leagues. Last season, Valk was among the top 10 scorers in the AHL and decided on a fundamental change in career – getting ready to leave North America for the first time. - Curtis, on the internet there’s a lot of talk about your great uncle, the famous goalie Kelly Hrudey. Did you decide to follow in his footsteps? - Yes, that’s right. He was the husband of my grandmother’s older sister and he’s still a really big deal in Los Angeles. But I decided on hockey for myself, like pretty much every boy in Canada. But Kelly really helped me. When I was only five he took me and my family to visit the Kings’ arena. He showed us the team’s locker room and loads more. It was really great and it just fired my ambitions even more. I wandered around the locker room, touching everything, saying hello to these great players. I understood that one fine day, I wanted to be like them. Then, when I was a bit older, Kelly used to give me advice on how to up my game. He talked about goalies’ weaknesses, and where best to shoot so I could score more. He showed what it meant to train like a pro, taught me the warm-up exercises that the NHLers use and basically explained everything about life as a pro athlete. - In your first season in pro hockey you played alongside Linden Vey for Medicine Hat Tigers. What do you remember of that time? - Linden was just on fire back then, and somehow managed to get more than 100 points that season. He set a new league record. I used to sit next to him in the locker room. He was one of the leaders on that team and I was a rookie, trying to watch and learn from guys like him. He helped me with lots of things, we play a similar style. I owe him a lot for what I achieved in that first season. But I would never have imagined that a few years later we’d meet again on the other side of the world, playing in the KHL. - Who else do you know among the current KHL players? - I remember meeting Philip Larsen at camp with Vancouver and I played with Niklas Jensen for the Utica Comets [Vancouver’s farm-club]. And last season I was on a team with Harri Sateri, the former Vityaz goalie. My father’s ancestors were Dutch and I believe that ‘valk’ is the Dutch for ‘falcon’. But I don’t mind if people think of me as a wolf – it’s also a noble beast. - Which of them was your main ‘guide’ to the KHL? - I spoke with Harri, but the biggest help for me was Darren Dietz. We’ve been great friends since we were kids, plus he played for the club that I was looking to join, so he could give me a full breakdown of all the issues. - Which of your seasons in North America had the biggest impact on you, and helped you realize you were ready to move to the next level? - The last one. I ended up as top scorer on my team and was among the top 10 scorers in the AHL for the season. That helped me believe in myself and, I think, helped me take a step forward. - You also fulfilled that childhood dream and played in the NHL. How was it? - On the Sunday the coach called me into his office after the game and told me that tomorrow I was flying to Florida and I would play against Dallas. As soon as I got out of the office I started calling all my friends and relatives so they could start buying tickets. As for the game … I was a bit nervous at first, I was shaking a bit in the first few minutes, but after I couple of shifts I relaxed. It’s the same hockey. Sure, it’s the game you always dreamed of, but once that dream comes true it calms you down. In the game I had a lot of support from Jason Spetz, one of the great Dallas players, and everything went great in the end. - Why did you decide to make such a big change in your career? - The KHL is a good league and for me this is a chance to continue my growth as a player. Here, I’m playing a different role on the team, it’s a different type of hockey, a different way of moving around the ice. My friend Darren had a lot of good things to say about Barys and about Astana, so I also wanted to give it a go. My agent was in talks with a few clubs, but I was most interested in the offer from Barys. - What did you do when it became clear that Kazakhstan was a real possibility? - I picked up my phone and started Googling! I started reading up about Astana and Barys. Then I called Darren and really interrogated him. Next, I discussed everything with my family. My dad took it well, but my mom was a bit worried that I was going so far away. But once they had a talk with Darren’s folks, they calmed down. - You mentioned your family, could you tell us a bit more about them? - My father owns a construction company, he builds houses. That’s his life’s work. Mom works in a shop that provides costumes for actors and dancers. I have two sisters and a younger brother, who are studying at college. - Your father might have been counting on you to take over the family business one day. - Not really, he always left me to make up my own mind and now I’m the only athlete in the family (laughs). He’s really pleased that I’m doing something that I love, he’s always supported me and helped me to develop. My younger brother also started out playing hockey but then switched to golf. - How much did you know about the KHL before you came here? - Not much, to be honest. I knew a few of the cities in the league, I knew about teams like SKA, CSKA, Dynamo Moscow. But the details – conferences, divisions, how many games – I didn’t know. But I fairly quickly caught up with all that. - What about your first impressions of working here in Astana? - Really good. Pre-season training is tougher than in North America, and we’re spending more time on it. Back home it’s maybe only a couple of weeks. But our coach has some good tactics and some interesting approaches to practice, both on and off the ice. The KHL is a really good league, and it’s a chance for me to grow as a player. Here, I have a different role on the team, I’m playing a different kind of hockey. - You don’t have any trouble understanding your instructions? - No, not really. If anything is hard to understand, then Sam [Maxim Semyonov] can translate and explain it all. 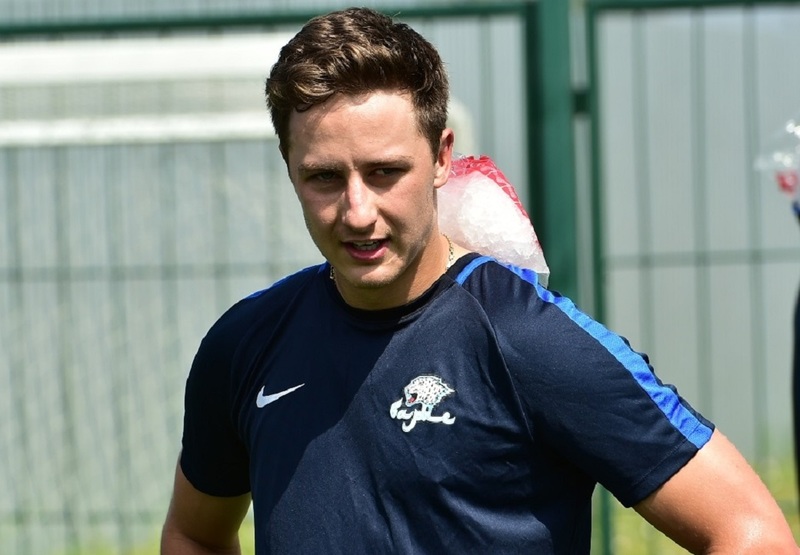 - Which players have been most helpful to you since coming to Barys? - All the imports who have played here before have been really helpful. Kevin Dallman, Bo [Brandon Bochenski], Henrik Karlsson and, of course, Darren Dietz. We often meet up for dinner and we spend a lot of time together. As far as our game is concerned, I get most advice from Andre Petersson and Bo. We’re playing on the same line. Before the first game at the President’s Cup, Brandon said that I’d need to be more patient than in North America. Over there you can be more aggressive, run around like crazy, but if you try that here you’ll quickly get tired. - You sit next to Brandon in the locker room and he famously loves to play jokes on his team-mates. He never gave Mike Lundin a minute’s peace. Has he already got you? - What did you make of your experiences at the President of Kazakhstan’s Cup? - Like Brandon said, I needed to rebuild my game a bit, play with a bit more patience and find the right tempo for the game, not just rush around everywhere. That didn’t happen right away. I had to train my thought process, because here you need to take everything into account to be able to create chances. - In that tournament you played on a line with a Swede (Andre Petersson) and a Russian (Nikita Mikhailis). What language did you speak? - We spoke hockey! (laughs). We used a lot of gestures, plus Andre speaks really good English so there wasn’t a problem. And Nikita’s a really smart guy, he understood what I was trying to say, even when it was in English. All three of us play in a similar style and if you have the same understanding of the game it doesn’t really matter what languages you speak. - Barys finished third in the tournament, which was a bit of a disappointing result. - There are a few reasons for that. The team has changed, a new coach has come in, we’ve changed tactics a bit, set up some new lines. Plus, these were our first games of the season. It’s not an excuse, of course, every athlete wants to win, but I’m sure we will look better further down the line. - You’re not the biggest of players. Do you think that will be a bonus or a challenge in the KHL? - I think it can be a big advantage for me. You don’t see so many big hits here, which is already a good thing for me, plus when they do happen there’s more space on the ice so it’s easier for me to dodge them. In addition, the bigger guys find it harder to catch me, which means I’m able to draw more penalties. - What do you expect from your first KHL season? - The main goal is to keep developing, to learn something new every day. If every player is trying to get better, that reflects on the team. Also, last season my team didn’t make the playoffs, which is always a blow because the playoffs are the key part of the season. So I want to put that right in the KHL. - Life in hockey means a lot of travel. Which places are you looking forward to seeing? - Everywhere! I’ve never been outside of North America before so I was really excited about flying to Astana. I’ve heard that Moscow and St. Petersburg are really beautiful cities, we’re going to Europe, to China … I can’t wait to discover it for myself. - And finally, how should we translate your surname? - (laughs) When I came here, Darren told me that it sounds like the Russian word for ‘wolf’. In Canada it doesn’t really mean anything, but my father’s ancestors were Dutch and I believe that ‘valk’ is the Dutch for ‘falcon’. But I don’t mind if people think of me as a wolf – it’s also a noble beast. Born: Feb. 8, 1993 in Medicine Hat, Canada. Career: Medicine Hat Tigers (WHL) 2010-14; Utica Comets (AHL) 2014-2017; Kalamazoo Wings (ECHL) 2014-2016; Springfield Thunderbirds (AHL) 2017-2018; Florida Panthers (NHL) 2017-18; Barys Astana 2018- present.